Built in 1860 by Wilson Thomas as a wedding gift to his bride, Lizzie, Chestnut Hill on the Delaware reflects the enchantment of a bygone era where guests are lavished with personal attention. Visiting Chestnut Hill is truly a nostalgic journey back in time to the turn of the century. This opulent mansion retains nearly all of its original details, including the magnificent one and a half story central staircase with walnut railings, floor to ceiling windows and doors facing the river, cherry and oak floors, ornate porch iron work and the many antiques and memorabilia that were original to the first owners of the house, including a turn of the century Maria Theresa chandelier. Today Chestnut Hill is owned by Rob and Linda Castagna, who have the honor of being only the third family to reside in this extraordinary house. This is their twenty-second year in the inn. 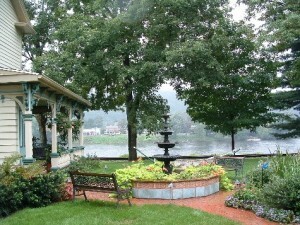 Adjacent to Chestnut Hill is the Country Cottage by the River. Both are impressive standing alone. Together, they make this estate quite spectacular. Next to Country Cottage is a garden sanctuary with a fountain and a hammock, where couples can discover breathtaking views of the Delaware River, or rediscover breathtaking views into their lover’s eyes. The grounds of the estate also offer plenty of room to stroll and explore, including a terraced garden on the slopes of the riverbank and a forty-foot riverfront deck. Perhaps the most unique aspect of the grounds is the 19th century, seldom used, railroad track that runs across the front lawn. 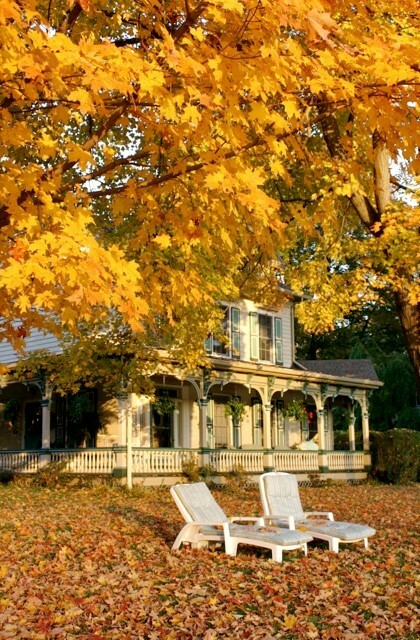 The Belvidere & Delaware River Railway operates 16 miles of rail line along the Delaware River between Phillipsburg and Milford, New Jersey, and just superbly compliments the romantic turn of the century charm of this estate. Chestnut Hill offers a choice of six guest rooms in the main house – Teddy’s Place, Hearts & Flowers, Rose Garden, The Bayberry Room, The Pineapple Room and Summer Morning. In true bed and breakfast tradition, breakfast is included. For those guests who wish to dine on their own, adjacent to the main house is The Country Cottage by the River and two guest suites above the cottage – The Paradise Suite and The Palms. Each of these include a fully stocked kitchen, including coffee, tea, cinnamon raisin bread, eggs, milk, butter and cereal with a dishwasher, stove, fridge and microwave. Every guest accommodation enjoys a unique whimsical theme featuring antiques, hand-painted wall murals and little touches that will make every stay memorable. The accommodations also feature thoughtful amenities such as private baths, TV/VCR, CD player, telephone, desk with data port and central heat and air-conditioning. Chestnut Hill boasts a new guest suite, Summer Morning. Summer Morning could not have been more appropriately named. This beautifully decorated room feels so warm, soft and cheerful, one can’t help but feel relaxed and carefree – like, well, a summer morning. I would not have been surprised at all if I had woken in the morning to find fresh dew covering the room. Summer Morning so is cheerful and uplifting it just exudes romance. Large windows flood the room with bright sunshine and offer gorgeous views of the Delaware River. It is opulently equipped with a king size four-post bed, hand crafted in Argentina by Italian craftsmen, a remote control fireplace, a hidden armoire featuring hanging space and drawers, a writing desk and a luxuriously padded chair for relaxing and enjoying the view. Summer Morning also features a large private bathroom with a two-person, heart shaped whirlpool tub, a separate shower and terry cloth bathrobes. Imagine relaxing in front of the glow of a cozy fireplace, or unwinding in the romance of a private Jacuzzi. You’ll find life easy, easy like Summer Morning! Culinary delights are a significant part of the experience at Chestnut Hill. Upon arrival, guests are greeted with a plate of cookies and various beverages. Each morning, a gourmet breakfast is presented and served on fine china, crystal and linens. The aroma of freshly brewed coffee and tantalizing breakfast specialties, fresh from the oven, beckon guests to a morning feast at Chestnut Hill. That first cup of brew savored on the veranda overlooking the quietly waking river as guests gather in the dining area is just a little bit of heaven! Beginning with fresh juice and special blends of tea or coffee, Rob and Linda serve a plate of fresh fruits arranged into an artistic presentation, followed by homemade bakes and a hot entree. The array of fresh and hearty breakfast fare is served at 9:00 a.m. providing a relaxing time of pleasant conversation. 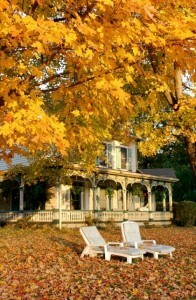 Chestnut Hill is located within easy walking distance of downtown Milford. A unique and picturesque little town on the eastern bank of the Delaware River, Milford offers visitors a chance to step back in time. This small, out-of-the-way town charms visitors with a slower pace and a sense of living history.